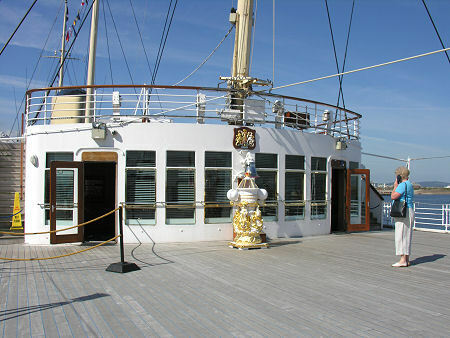 After an active lifetime in which she sailed over a million miles, the Royal Yacht Britannia is one of the world's best known ships. 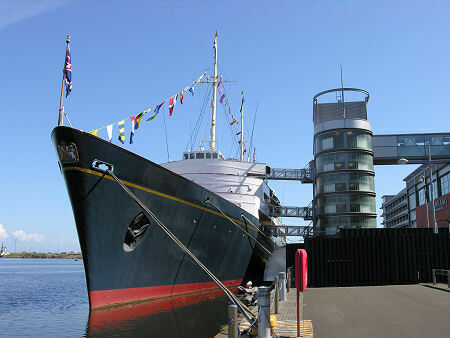 Britannia was launched at John Brown's Shipyard in Clydebank on 16 April 1953 and she was decommissioned at Portsmouth Naval Base on 11 December 1997 in the presence of the Queen, The Duke of Edinburgh and fourteen senior members of The Royal Family. During the intervening 44 years she carried the Queen and the Royal Family on 968 official voyages in almost every part of the globe. 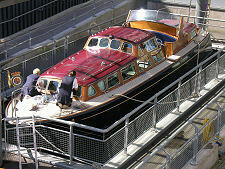 Britannia was the 83rd, and last, Royal Yacht in a tradition that dated back to 1660 and the gift of the Mary by the people of Amsterdam to King Charles II. Thankfully another old tradition, of sinking Royal Yachts at sea after they had been decommissioned, was not followed, and instead the Government invited proposals from UK cities interested in providing Britannia with a suitable home. 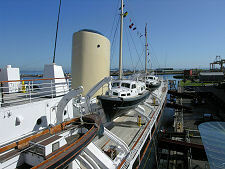 Edinburgh was the successful city, and Britannia is now owned by The Royal Yacht Britannia Trust, a charitable organisation whose sole remit is the maintenance of Britannia in keeping with her former role. Britannia is now permanently berthed at Ocean Terminal, in Edinburgh's historic port of Leith, and visitors can now see for themselves all aspects of life on this remarkable ship. A visit to Britannia is a superb experience. Her conversion from a mixture of palace, embassy, holiday home and naval vessel into a tourist attraction has been carried out with great sensitivity and integrity. The visitor reception area is on the second floor of the Ocean Terminal shopping centre, which is also home to an interpretive exhibition and, as you exit, the shop. From the shopping centre you pass over a bridge giving access to a glass and steel tower that is the key to Britannia's excellent accessibility. 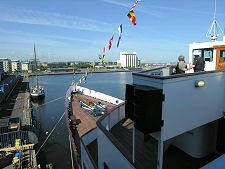 This contains both stairs and a lift, and from this tower further bridges give access to the ship at four different levels. The result is that although you might imagine a half-century-old ship to be a very difficult environment in which to arrange level access, in practice all parts are fully accessible. Maybe it's because it is called a "yacht", but your first surprise on seeing Britannia is its sheer size. To put it in context, it is the same overall length, 125m, as the largest vehicle ferries operating purely within Scottish waters, the Shetland ferries Hrossey and Hjaltland. Each of these has 100 passenger cabins and can carry 600 passengers plus cars and freight, and the crew: so the fact that Britannia had a crew of up to 240 suddenly appears less astonishing. But having got a grip on the relative size of the Britannia you rapidly run out of comparisons based on other ships. Instead, you quite quickly start to think of Britannia as something much more like a floating stately home, though with some interesting differences. 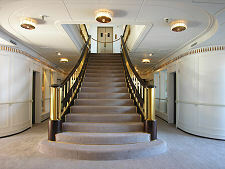 Like a stately home, Britannia has an "upstairs" and a "downstairs": a clear distinction between the accommodation meant for the the passengers on the one hand, and that intended for the people employed to make it all happen on the other. On Britannia, however, there was also a clear division between the front half of the upper ship and its rear half. 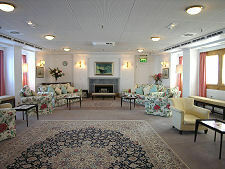 The latter provided the accommodation, state rooms and facilities for the royal passengers and their staff, while in the former you find the bridge and the officers' accommodation. 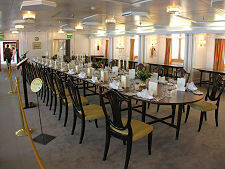 A tour of Britannia allows you to experience and explore these many different facets of this remarkable ship. 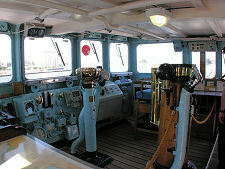 You start on the upper level at the front in the bridge, complete with the Admiral's chair, on which no one else was allowed to sit (Britannia was almost always captained by an Admiral). Beneath this you enter the officers' domain. 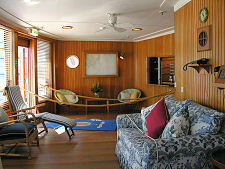 Here you find what in many ways seems the most comfortable and well appointed cabin on the ship, the Admiral's day cabin, with his sleeping quarters nearby. 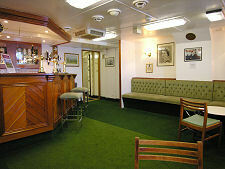 Other officers did a little less well, and you can see some of their cabins plus the wardroom and its anteroom in which they spent much of their off-duty time. 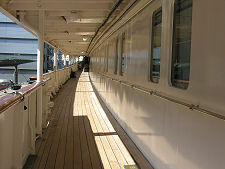 Accommodation for the royal passengers was on the upper three decks of the ship behind the area occupied by the officers. Uppermost was a suite of rooms extending from the sun lounge at the rear, to the - surprisingly modest - bedrooms for the Royal Family. From here a grand staircase led down to the deck comprising mainly the State Dining Room and the State Drawing Room, both rooms that were designed to impress. The Drawing Room is the more homely and has an electric fire for those colder days: the Queen was eventually persuaded that a coal fire would have presented a hazard at sea! 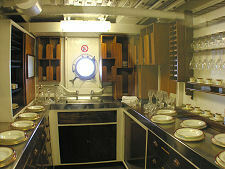 As you tour successively lower decks on Britannia you become aware of the very stratified nature of naval life, with different groups having different living and recreational areas. 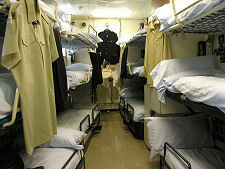 And in the bowels of the ship you come face to face with the triple stacked bunks on which many of the crew lived. You also have the opportunity to visit the ship's sick bay, the huge laundry, and the engine room complete with engines kept so clean that when they were in use a doormat was provided on which visitors were asked to wipe their feet when entering.